Last Friday, an important part of the US yield curve inverted, causing a sell-off in stock markets. The interest rate that investors demand on 10-year U.S. Treasuries fell to as low as 2.416%, at the end of a week during which the Federal Reserve hugely revised its monetary policy stance in response to indicators pointing to a global slowdown. Continued weakness in European and Chinese manufacturing has combined with data showing a deceleration in US activity. Yield curve inversion is where the yield on a bond with a shorter maturity is higher than that on a bond with a longer maturity. History suggests that yield curve inversion can predict future recessions as investors bet on lower future interest rates, but those recessions have taken time to manifest. Figure 1 shows the difference in yield between a generic 10-year U.S. Treasury and a 2-year Treasury bond and a 3-month Treasury bill respectively since 1983. 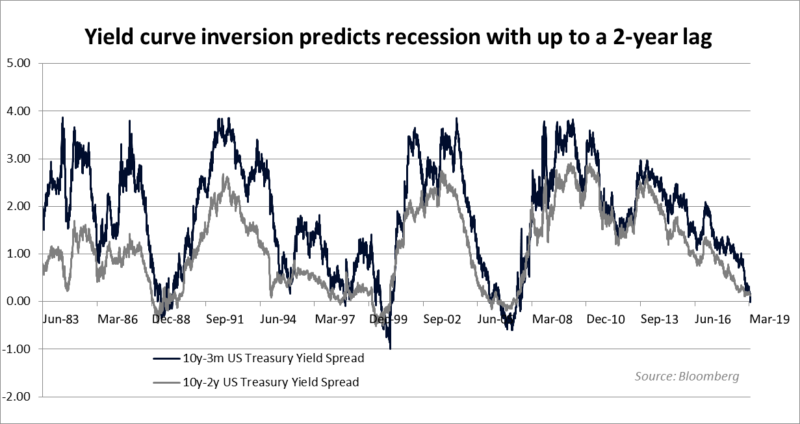 The last three occasions on which the yield curve inverted were early-1989, early-2000 and mid-2006; the last three recessions started in July 1990, March 2001 and December 2007. Figure 1: The spread (or difference) between 10 year U.S Treasury yields and 2-year yields and 3-month yields respectively. This week, with markets pricing in rate cuts for some months, the Federal Reserve blinked and announced that it would commit to making no rate hikes this year and would start tapering its balance sheet run-off policy. Why was this decision such a big deal for investors? The question is actually a more specific form of a broader one: Why is monetary policy in the United States so important for the global financial system? In answering the second question, we can better understand the answer to the first. Last year, economists Matteo Iacoviello and Navarro Gaston at the U.S. Federal Reserve asked this question and what they found was striking. Looking at macroeconomic data covering the period 1965-2016, they found that the effects on economic growth of monetary tightening from the Federal Reserve are almost as strong outside the U.S. as they are within it. The authors explain the transmission of US policy worldwide as occurring through standard exchange rate and trade channels, with countries that trade with the US and manage their currencies in line with the dollar more strongly affected. As US rates rise, the dollar appreciates. In countries for which a stronger dollar causes inflation to rise or balance sheets to deteriorate, or where the government has tied its currency to the dollar, there is pressure for interest rates to rise too. As the experience of 2018 showed, emerging market countries such as Turkey, South Africa and Argentina with high inflation, exposure to the dollar, current account deficits and low foreign reserves can be severely constrained by tight U.S monetary policy. But what we have learned in recent years is the importance of the Federal Reserve being is at the heart of a global capital cycle that is fuelled by the US dollar. In a seminal paper – Dilemma not Trilemma: The Global Financial Cycle and Monetary Policy Independence – economist Hélène Rey argues strongly that the Federal Reserve can single-handedly direct global monetary policy. She finds that there is a global financial cycle in capital flows, asset prices and credit growth. This cycle co‐moves with the VIX, a measure of the uncertainty and risk aversion of the markets. Asset markets in countries with more credit inflows are more sensitive to the global cycle, and this cycle is not necessarily in line with countries’ specific macroeconomic conditions. Her analysis suggests that one of the determinants of the global financial cycle is monetary policy in the centre country – i.e., the US – which affects leverage of global banks, capital flows and the growth of credit in the global financial system. Investors have been so fixated by the Federal Reserve’s monetary policy because it has such a direct effect on global liquidity and the VIX. Rey also finds that when capital is freely mobile, the global financial cycle constrains national monetary policies regardless of the exchange rate regime – fixed or floating. An example is the relationship between Europe (the euro area) and the United States, whose currencies float against each other. European banks borrow significant dollar amounts partly to support companies with U.S. business investments but mostly to fund dollar investment in the United States and in emerging markets. Figure 2 shows the Euro-dollar cross-currency swap basis1. The basis, if negative, shows the premium that euro investors have to pay to borrow dollars on top of the dollar interest rate. Banks tend to borrow on a short-term basis, so very large increases in US interest rates can create serious liquidity issues. On two occasions, late 2008 and late 2011, the basis exceeded 150 basis points. In the first case, dollar investors were concerned about the exposure of European banks and hedge funds to sub-prime U.S. mortgages. In 2011, they were worried that a Eurozone struggling with recession and rising sovereign bond yields could lead to anything from bank failures to the break-up of the euro. On both occasions, it was only the Federal Reserve that could step in to provide dollar liquidity, and they did so using swap lines2 – loans of hundreds of billions of dollars to the European Central Bank, which would then supply these funds to commercial banks. This example shows both how US financing conditions deeply influenced Europe and how the situation was essentially out of the hands of its central bank, the European Central Bank. 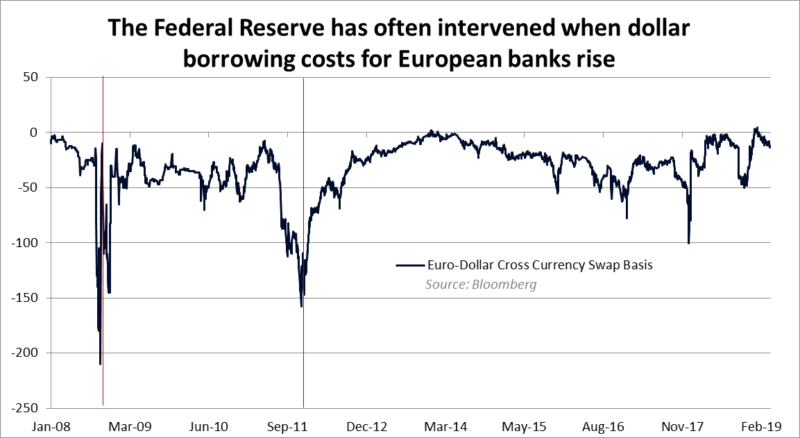 Figure 2 shows the euro-dollar cross currency swap basis. When it is negative, euro borrowers of dollars have to pay a premium on the dollar interest rate. For the past few decades, international macroeconomics has advanced the idea of a policy “trilemma”. This trilemma says that free capital mobility and independent monetary policies are feasible only if exchange rates are floating. However, Rey shows that the global financial cycle transforms the trilemma into a dilemma. Independent monetary policies are possible only if the capital account is managed. Or, in other words, if a country is open to foreign capital, it will be influenced by the monetary policy of the Federal Reserve – whether or not it is a developed or emerging economy, and whether or not it has a high current account deficit. Given that most countries are plugged into the global capital cycle, what the Fed does matters. 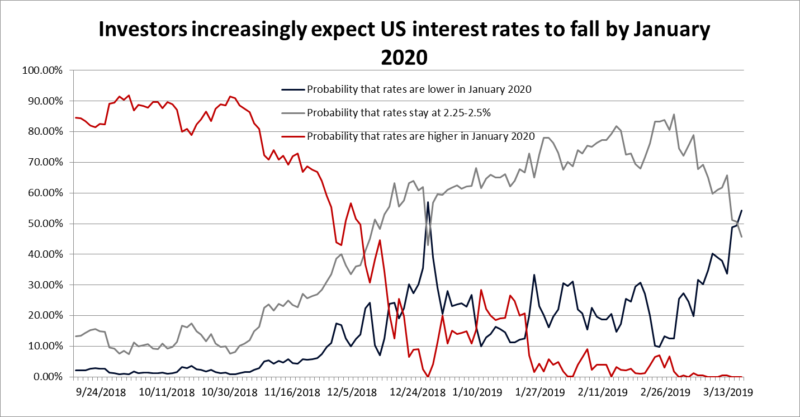 Figure 3 shows that markets predict that the probability of interest rates being higher that 2.5% in January 2020 has fallen from 90% as recently as October last year to almost 0% today. Markets now think that rates will either be unchanged or lower at the turn of the year. Figure 3 shows interest rate expectations for the meeting of the Federal Open Markets Committee in January 2020, inferred from rates set in the futures markets. Part of this sentiment flows from the dovish attitudes from Fed Chair Jay Powell, who has indicted that he may be willing to reinterpret the mandate of the Federal Reserve, particularly in relation to its inflation target. Formally, the Federal Reserve has a price stability mandate that policymakers have long interpreted as targeting an inflation rate of 2%. But a quick glance at Figure 4 reveals that this target has not been interpreted symmetrically. 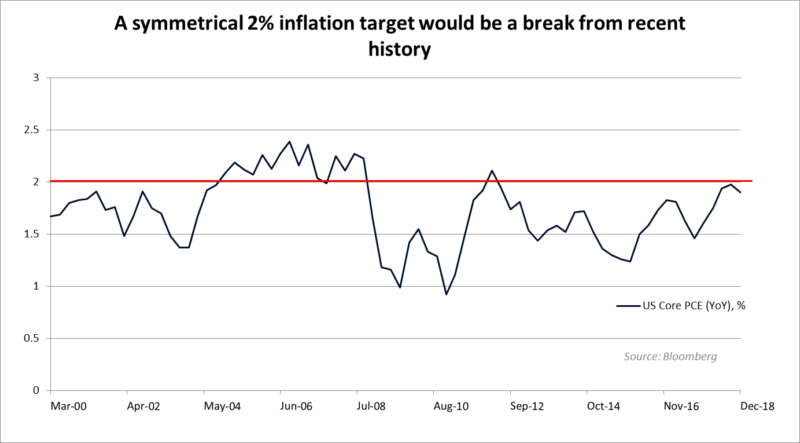 For most of the period since 2000, and especially since 2008, the central bank has allowed inflation to settle below the target rather than above. In a recent speech, Powell suggested that he may be willing to run the US economy hot to make up for years during which core inflation has been well below 2%. This could mean not responding to strong wage inflation and keeping monetary policy looser than usual. Figure 4 illustrates core US inflation rates since March 2000 and suggests that the Federal Reserve has shown a bias towards keeping inflation below rather than above its informal 2% target. Such a stance, should it materialise in policy actions, could provide a much needed boost in liquidity to the global economy at a time when Europe looks weak and China is managing a hard landing. However, while a looser U.S. monetary policy may keep the global capital cycle going, it neither guarantees higher inflation nor deals with the substantial rise in leverage and debt as a result of the loose policies of the last decade and the lack of productivity growth and innovation in advanced economies. While investors have welcomed the more dovish Fed, they should not assume that risks to the downside have been pushed into the distant future. 1 Formally, the euro-dollar cross-currency basis is approximately the difference between the forward euro-dollar exchange rate and the spot euro-dollar exchange rate minus the difference between US and euro interest rates. 2When the foreign central bank draws on the swap line, it sells a specified amount of its currency to the Federal Reserve in exchange for dollars at the prevailing market exchange rate. 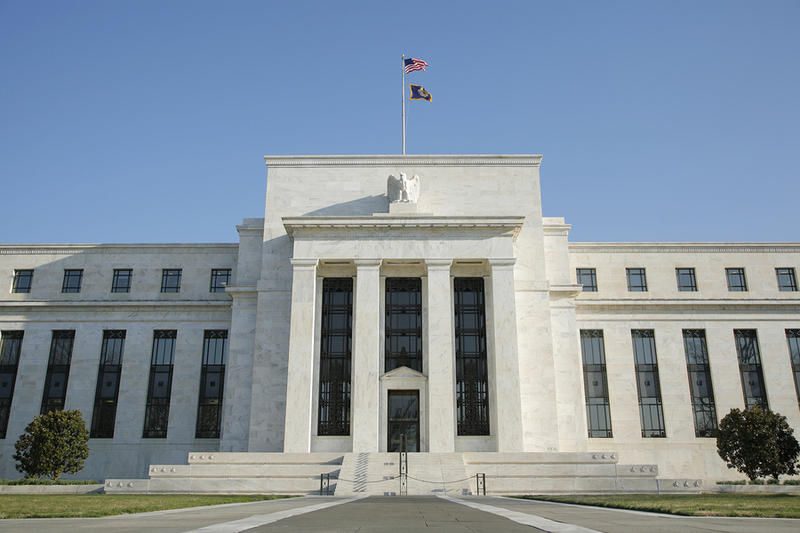 The Federal Reserve and the foreign central bank enter into a binding agreement for a second transaction. In this transaction, the foreign central bank is obliged to repurchase its currency at a specified future date at the same exchange rate. The Fed charges interest on its swap lines, which the foreign central bank passes on to the end user. Source: Federal Reserve Bank of St. Louis.